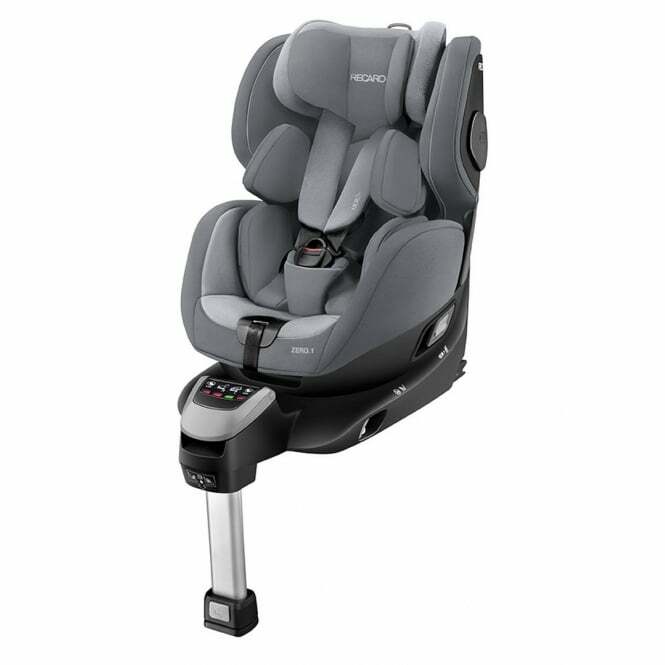 Recaro Zero.1 i-Size Car Seat offers children comfort and safety from birth up to 105 cm. Thanks to its clever 360 degrees rotating function (reboarder), the child seat can be switched from forward facing to rearward facing - one-handed. The Zero.1 i-Size Car Seat by Recaro provides children comfort and safety from birth up to 105 cm. Thanks to its clever 360 degrees rotating function (reboarder), the child car seat can be switched from forward facing to rearward facing - one-handed. Ingenious 360 degrees rotatable child seat allows you to get your child in and out the car with ease, as well as easily changing between the rearward and forward facing positions. Safe rearward facing travelling position up to 105 cm. Alternatively, the Recaro Zero.1 i-Size Car Seat can be used in the forward facing position from 15 months old. Intuitive one-hand-touch for all important functions. ISOFIX connection for an easy and secure installation. Foldable wings for maximum side impact protection. The HERO safety system of the Recaro Zero.1 i-Size Car Seat prevents belts from slipping or twisting and makes buckling up easy. Flexible insert cushion for optimal, ergonomic fit. Height adjustable head supports with memory foam. Comfortable seating foam adapts perfectly to the body shape and provides necessary support. Seat recline position in both directions. Is there a review of the Recaro Zero.1 i-Size Car Seat? Your Review - Excellent car seat !